If you’ve ever found yourself on a flight longer than eight hours, you have undoubtedly experienced the travesty of the modern airplane meal. While shorter flights do the courtesy of refraining from dinner service, or providing the tasty, yet utterly unhealthy “Snack Pack” (Pringles and M&Ms for supper anyone? ), longer flights are often plagued by what can only be described as lukewarm goop. 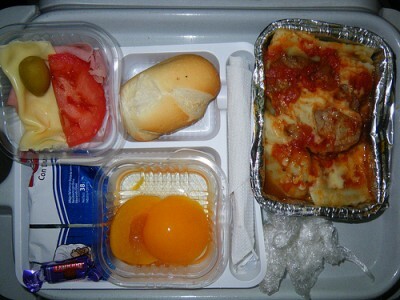 As a courtesy to hungry travelers everywhere, Huff Po recently outlined the best and worst airlplane meals. While no means a comprehensive or complete list, the article gave some insight into what kinds of food are currently being served. What topped the list as the best? Singapore Airlines takes the cake with finely-crafted meals, such as the “crab curry patta, [with] an infusion of coconut and mint chutney with pot-au-feu beef.” Doesn’t sound too shabby, does it, especially at a cruising altitude of 30,000 feet? On the contrary, United/Continental found itself at the bottom of the food chain (ha, puns) with a hodge-podge of different items, including mini muffins, super-sugary yogurt, and a canned fruit cup. Horrifyingly, one Continental flyer was served, “pan-seared turbot fish and grilled shrimp with lobster Newburg sauce.” What’s that? You think that sounds good? Well, do you know how hard it is to keep fish fresh? The airline is just setting itself up for failure with that one. Perhaps we should be easier on airlines. After all, everyone knows they are suffering economically, despite the amount of baggage fees we pay. And it must be difficult to serve a decent, warm meal in tight quarters for potentially hundreds of people. But airlines should keep it simple; think café style, or think fruit and cheese plate. I’d take a well-made grilled cheese paired with a bowl of chili over fish of questionable freshness any day. Unequivocally, your best option is to bring along your own grub. Not only will you save cash for tastier endeavors in your destination city, but you will be spared a sub-par dinner. Here’s my suggestion: Take one toasted Portuguese roll, layer it with sliced fresh mozzarella, chopped basil and tomato, then wrap it tightly in tin foil and stash it in your carry-on. Unwrap your tasty morsel mid-flight and chuckle diabolically at your poor seatmate relegated to the Newburg Sauce.